One of the many things I like about Tom is his willingness to engage with my neighbors when there's a tree problem that extends across properties. There was a tree in my neighbor's yard with a large rotting branch extending over my yard - it was just a matter of time before it would come crashing down. I connected Tom with my next-door neighbor, who ended up having WeRecycleTrees cut down the offending branch from the tree (she and I split the cost). Even better, Tom worked with my neighbor to address a number of other tree issues she'd been having on her property. My neighbor was reluctant to hire a tree service because she'd had a bad experience several years ago. But Tom and his crew provided great service (as they always do) and ended up pruning several other oak trees on her property and removing a half-dead hickory from her backyard. She was thrilled. Tom is great about working his way around the neighborhood to consult with people and help solve issues that affect all of us. Tom brings a refreshing combination of expertise, candor, and good old-fashioned customer service to the job. I've used him and his crew several times for mulching, trimming, and planting. They're always timely, efficient and clean. Tom's prices are reasonable for the high-quality work. I was most impressed when I asked Tom to take down a large oak that was leaning toward my house. Instead of removing the tree, Tom recommended cutting off several large branches. The job turned out great &endash; a year later, the tree is filling in nicely and the threat to my house has been greatly reduced. Plus I saved a lot of money. I turned to Tom at "We Recycle Trees" for pruning multiple very tall trees. I was impressed and very pleased at dealing with this company: turn around from first contact to completed job was very prompt; work done was excellent; care and expertise were obvious in controlling the swing of large heavy branches cut from high up; pricing was fair and competitive. I was particularly pleased with the honorable and straight forward way of doing business. 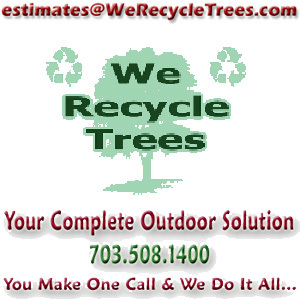 I will readily contact Tom / We Recycle Trees again for landscape and tree work, I feel I can rely on them. Tom Hayes has been doing a variety of yard projects for me for nine years, coming once or twice a year as needed. The projects he and his staff have done have included digging out invasive bamboo roots, clearing overgrown weedy areas, pruning, helping me design a perennial bed, for which he provided the plants and then did the planting, and many more. They have been reliable in coming when they said they would and doing a complete job. I plan to continue calling on Tom in the future. It's immediately obvious that Tom cares about his work, his crew and his customers. We were pleased to find him right here in our neighborhood. We Recycle Trees removed some large branches in our yard, cleared out some ivy and spread mulch. The crew was professional and respectful of our property. Tom knows about trees and a great deal more. If you want good advice, he's got it. And, he is very generous with his time imparting that knowledge to his customers. We will definitely call on Tom again. Tom was called about two "bee" hives in my yard. I described them and he quickly informed me those were no bees … they are Bald-Faced Hornets and they are as mean as can be. A day later, he was at my house double-suiting to remove the hives. He was responsive, professional, fast … and, oh yeah, a really pleasant guy. Thumbs up. We found Tom's prices were very reasonable and his crew does excellent work. They are pleasant to each other as they work. They do not waste time, they coordinate their work to make the best use of their time, and when they leave, whether at the end of the day or the end of the project, the area is neat and tidy. If you would like to see the work they have done for us just ask Tom to coordinate a time.